Large breed dog clothes can be difficult to find. For some strange reason manufacturers seem to think that only folks with little dogs want to dress them up. How silly! His chest measures 27 inches and he weighs 55 pounds. So, as you can see, he is a large dog but not huge or a giant breed. The above English Bulldog Sweatshirt certainly fits the bill. 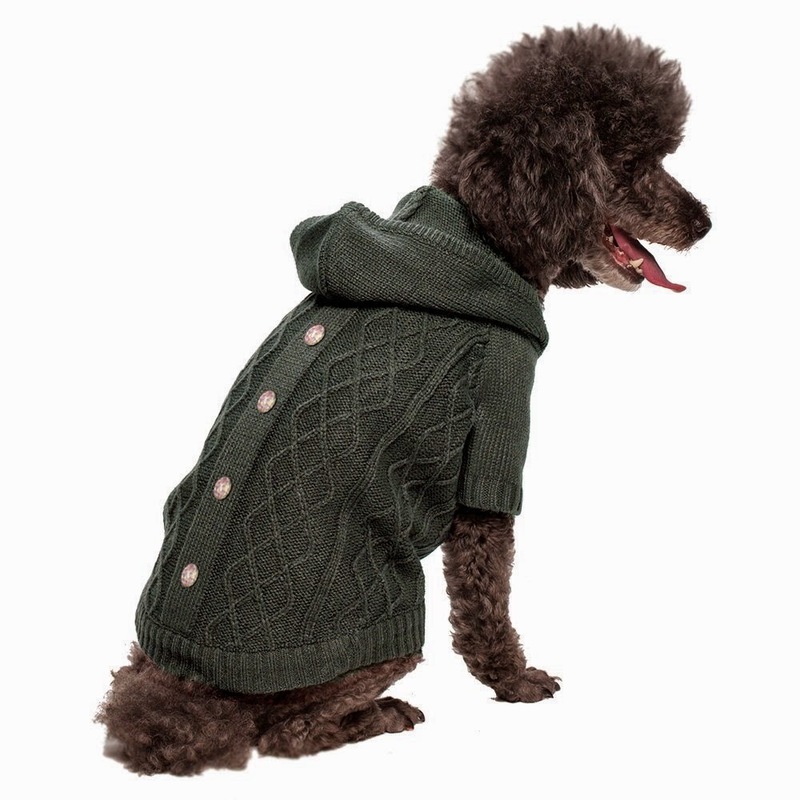 This classic hoody shirt is roomy enough to fit a dog with a chest measuring up to 32 inches. If your dogs chest is less than 24 inches this dog shirt is probably too big for your pup. 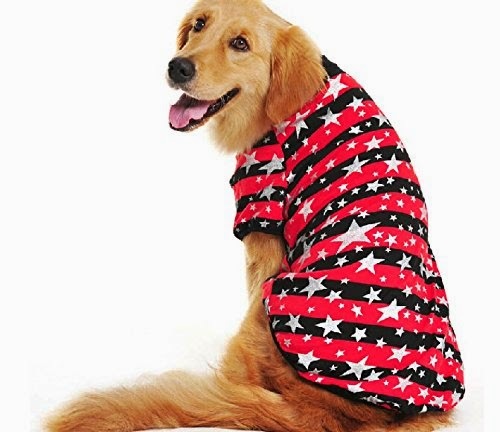 Next up we have an adorable Stars’n Stripes shirt modeled on a beautiful golden retriever. I do appreciate when artists display their large dog clothes on a large dog instead of a Chihuahua! This shirt is simple and stylish and will have your dog ready for any Independence Day (or other summer) celebration. It has sizes that will fit even giant breed dogs. Please be sure you check the right size when ordering. 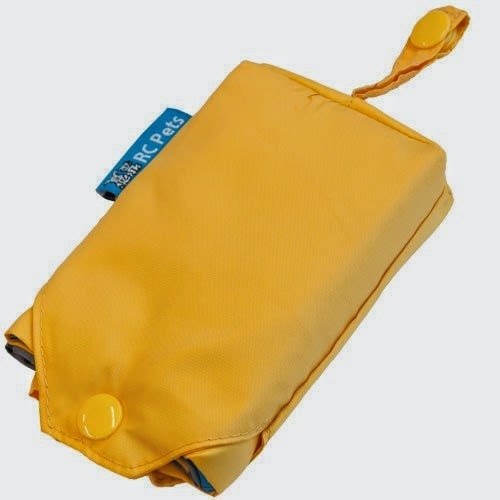 This is a highly packable rain poncho that will fit large breed dogs. It is made from lightweight taffeta that sheds water but folds up into a small space when not in use (see above). 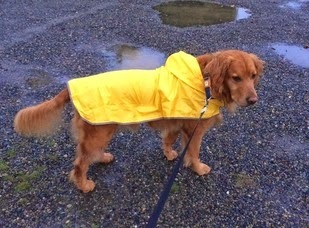 Another nice thing about this doggy rain poncho is it has an adjustable velcro waist band. This insures a snug fit to keep it in place and the rain off. It even has a leash access hole or slit at the neck. Though for some reason the owner of the pooch modeling it below chose not to use it. It is long enough to cover your dogs hips and flanks without getting in the way. It will fit dogs with a chest measurement as large as 33 inches. This is a great idea for folks who camp, hike or otherwise are outdoors a lot with their puppy and don’t want to deal with all the issues that come with a wet dog. (Sometimes the issues are the dog doesn’t like to be wet like my Bobo! For a big rough’n tough boy he is such a princess LOL ). Ok, I couldn’t believe this one when I saw it. 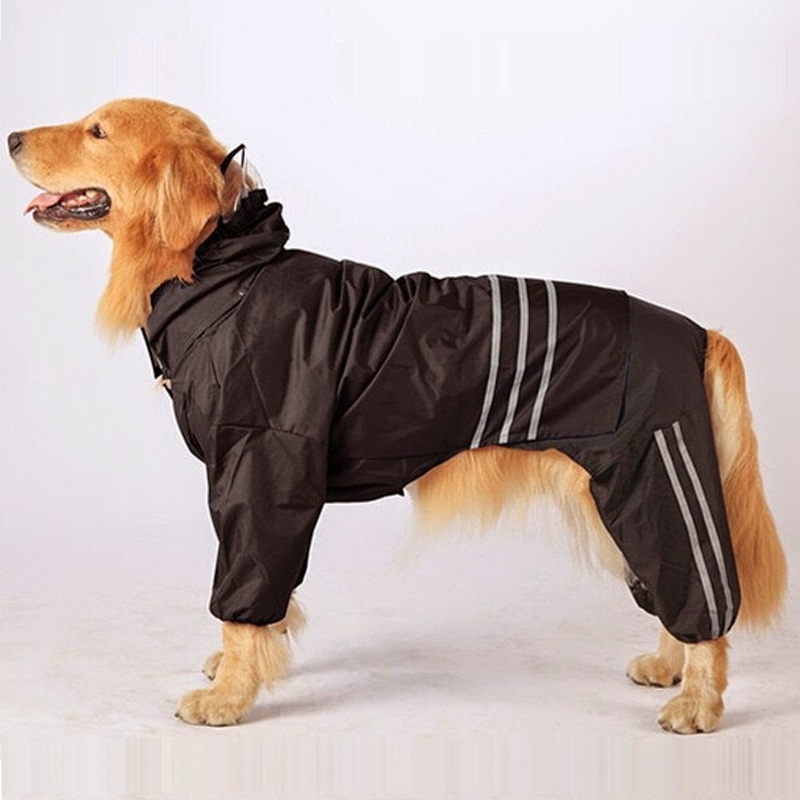 A full 3 piece hooded rain slicker/suite for your large breed dog! Can I just say AMAZING! Look how happy this pup is. He’s stylin and he knows it. I want to see my Bobo in this and I’ll bet you wanna see your happy puppy in it too. There are lots more pictures of this item right here as well as a size chart for those who are interested. Because there are three pieces to this set, it is very versatile. You are getting multiple looks with one purchase. Shopping smarter not harder. That’s the ticket. You could deck your pup out in just the top, the bottom or the hat. Actually, any combination of those would look cute. And it comes in blue too. Just look at those little pants! So cute! (Ok, maybe not so little but the sentiment is still valid.) 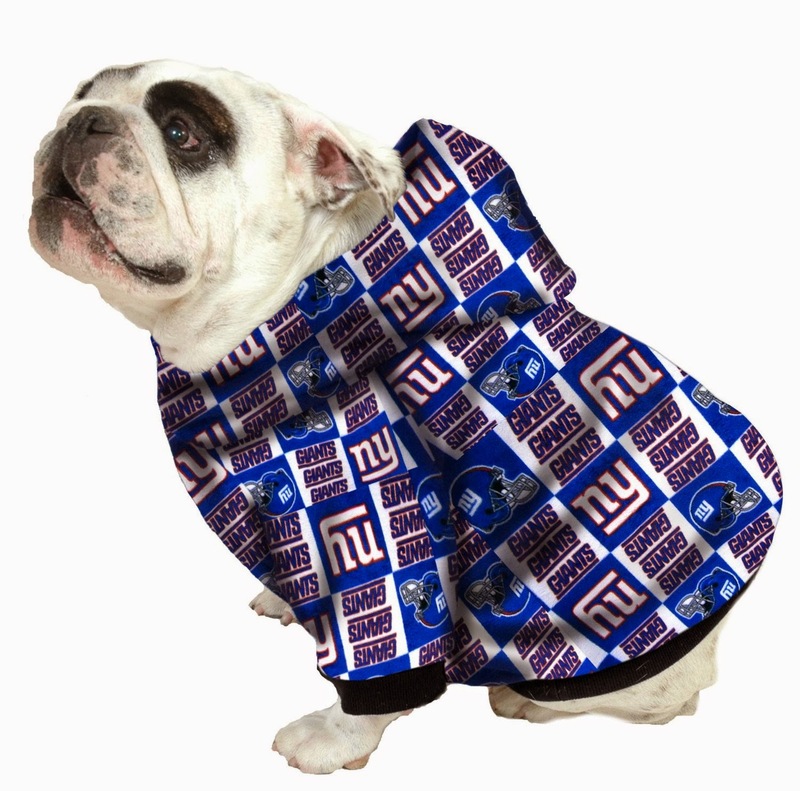 Can you imagine the attention your dog will get when you walk him down the street all pimped out in this doggy outfit?! It’s made from 100% acrylic yarn so it’ll keep it’s shape and size. That also means it’s easy to care for. Just toss it into the wash with your stuff to keep it super clean. The 4 crystal buttons down the back are a lovely touch. This dog sweater will keep your baby warm and cozy on those harsh drafty days. One last thing about this company. They have tons of different large breed dog clothes. Most places only have one or two that will fit a big dog. But these guys have dozens. We’ll do a full spread on them in the future. So you folks with large breed dogs keep an eye out for that. For now we hope you enjoy peeking at these two. Dresses for big dogs are probably the hardest kind of dog clothes to find. Go figure. But I persevered because I didn’t think this shopping guide for large breed dog clothes would be complete without at least one dress for the ladies! 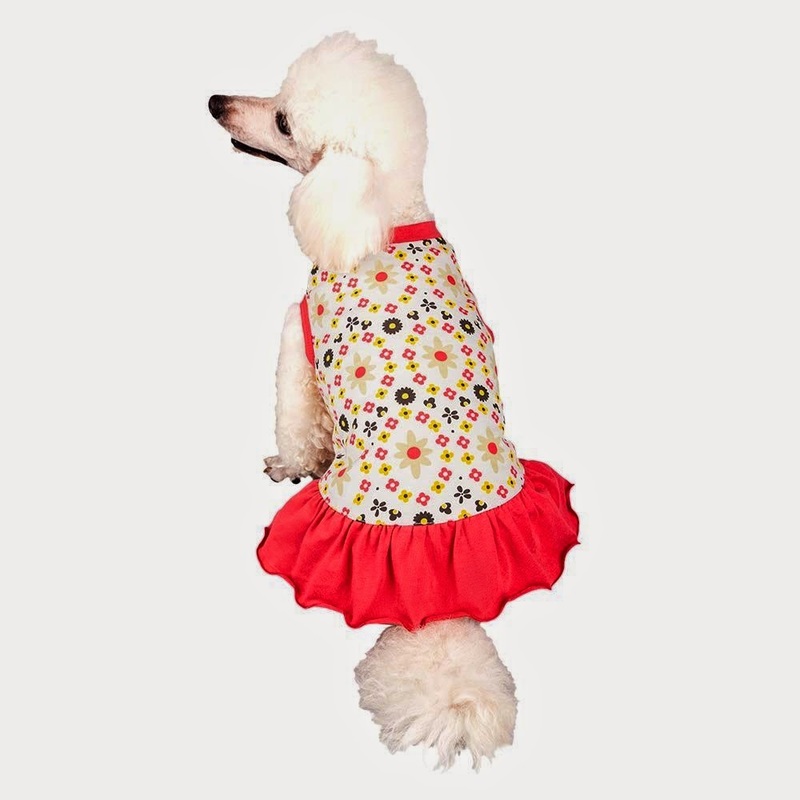 This pretty polo style floral cotton dog dress will look adorable on your “plus size pup”. It is cute and flirty with it’s ruffled skirt. Made from a t-shirt blend of polyester, cotton and spandex it is easy to care for. Just wash it in cold water along with your other mixed brights. 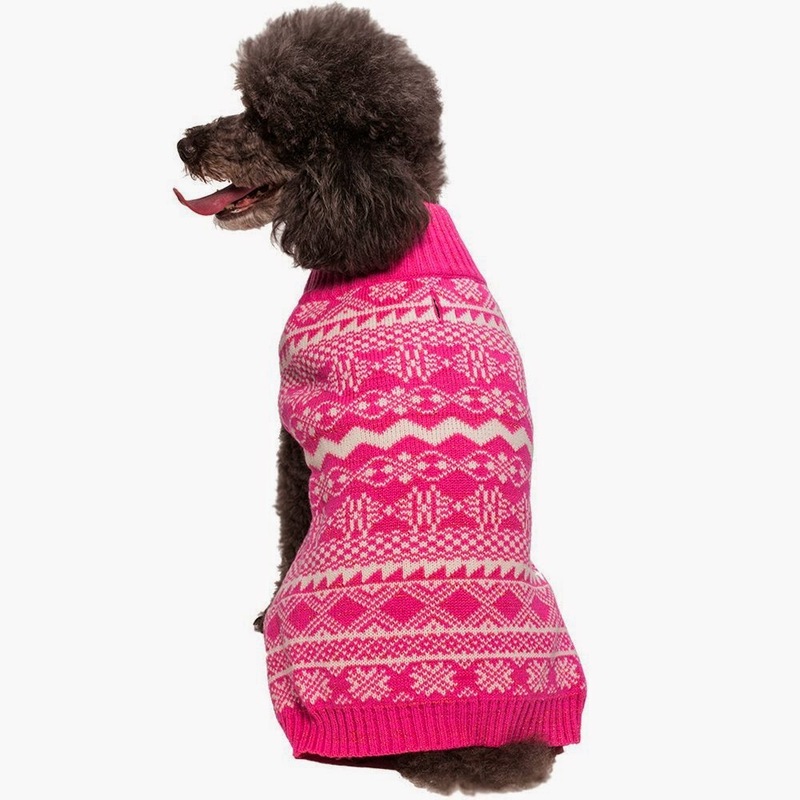 Well there you have it, our first ever shopping guide for large breed dog clothes. We hope you enjoyed the eye candy and found something useful for you and your favorite big doggie. 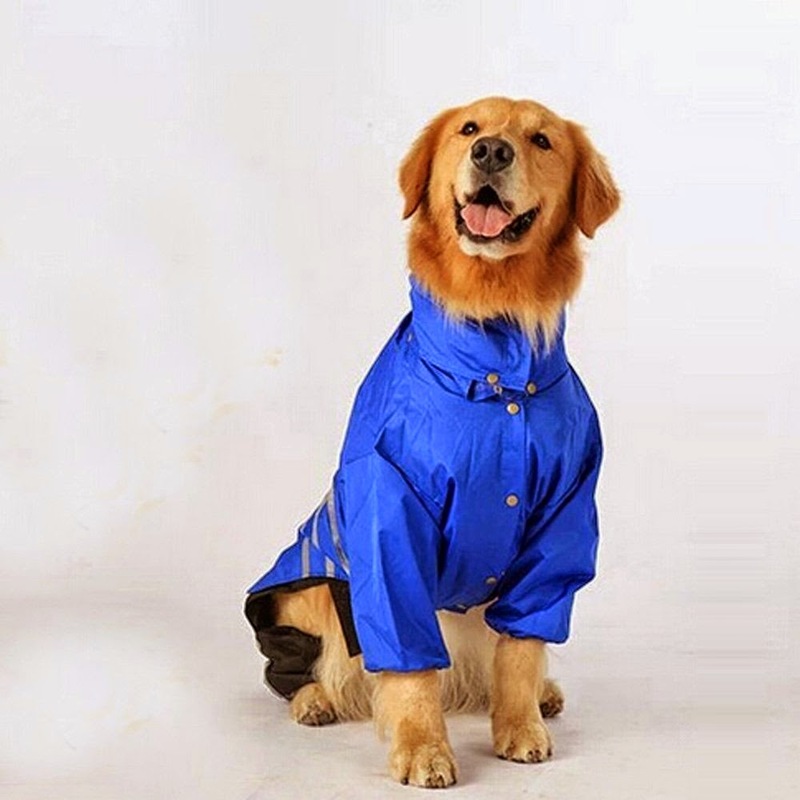 Like Large Breed Dog Clothes? Please Help Us & Tell Your Friends!